This preface is very short, not least because an introductory chapter incorporating much of the material of a conventional preface has been included and covers most of the important points in somewhat greater detail than we have scope for here. The reader should consult this as a guide to the structure of this volume, and the purpose it serves. Nevertheless, some general comments are pertinent. At a practical level, some understanding of the properties of food biopolymers is presumably historical, perhaps dating back to the invention of fire, when stone age man first discovered that heating animal carcasses increased their palatability. Indeed, one is reminded of the essay of Charles Lamb in which he claims that roast pork was first discovered by accident, when the pig-sty of an ancient Chinese village was accidentally burnt to the ground, consuming its unfortunate occupants. In the last 20 years, however, substantial scientific advances have been made in this area, by the application of ideas perhaps more common in other areas of macromolecular science to food biopolymer constituents, and this knowledge is now being applied in a non- empirical manner to the development of new products. One very successful example of this approach is the work on low-fat 'healthy option' products in which understanding of the thermodynamics, interactions, structure and rheology of mixed protein-polysaccharide gelling systems is being employed. 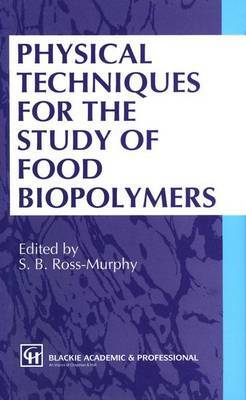 The present volume describes the application of modern macro- molecular techniques to the characterisation of food biopolymers.